Seventeen boats took to the water on Saturday to contest the 2016 Manhattan Yacht Club Trophy. 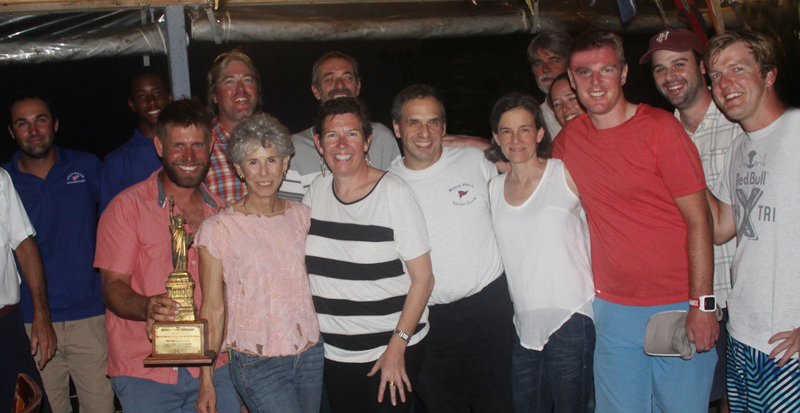 In 2002 the Manhattan Yacht Club (MYC) presented a trophy to the BVI and initiated an annual challenge between our home clubs, the Royal BVI Yacht Club (RBVIYC) and the West End Yacht Club (WEYC). Since then the two clubs have duked it out for the honour of raising the replica Statue of Liberty but for 2016 the MYC fielded a team of their own - could they do enough to claim their own prize? The first boat away was the WEYC's Wicked Wynch shortly followed by J24 Braivssimo and the 2 IC24s, Black Pearl and Latitude 18 all representing the Royal. The first leg took the fleet upwind from the start line off Nanny Cay to round the Rhone anchor buoys off the entrance to Great Harbour. Then it was downwind to pass both Pelican and Flannigan to starboard before returning to finish back at Nanny Cay. It wasn't long before the bigger boats began to reel in the early starters and battle ensued to the finish. The 120ft schooner, Arabella, was a majestic sight as she powered around the course offering a fine photo opportunity, but she didn't quite have the legs to catch the front runners. In the end there were just 3 minutes separating the top four boats with the Royal's Pipe Dream skippered by Chris Haycraft taking the line honours just ahead of team-mate Spike. First in for West End was Kevin Wrigley's Boomerang just 14 seconds behind Spike, with Henry Leonnig's Firewater taking fourth. The overall winner was calculated from an average of the scores for each team so with boats in first, second, fifth and sixth it was a clear win for the Royal BVI Yacht Club. At the prize giving ceremony hosted at the Royal BVI Yacht Club, MYC Commodore, Michael Fortenbaugh expressed thanks to both the local yacht clubs and there is little doubt that they will be back with a score to settle. Thanks go to the race committee, all the competitors and sponsors, Gosling & Tico, for their support.